Центр подготовки космонавтов представляет серию уникальных фотографий тренажной базы ЦПК в формате 360°. На фотографии – тренажёр “Выход-2”. Выражаем большую благодарность студии панорамной съёмки Feel 360 (www.feel360.ru) за потрясающие фотографии и высокий профессионализм. В состав тренажёра “Выход-2” входят два тренажерных скафандра типа «Орлан», устройство, обеспечивающее их обезвешивание и перемещение в рабочей зоне за счет мышечных усилий космонавтов, макеты шлюзовых отсеков, вычислительная система, наземная система обеспечения жизнедеятельности, система моделирования светотеневой обстановки, а также системы связи, телевизионного и медицинского контроля. Cosmonauta Training Center è una serie di foto uniche trenazhnoy lrc base nel formato di 360°. La foto – simulator “uscita-2”. Esprimiamo il nostro apprezzamento per il monolocale panoramico sento 360 (www.feel360.ru) per le fantastiche foto e alto livello di professionalità. We’ve gone on and on about the 450SX riders who don’t have rides coming into 2017. Heck, I’ve written and talked about the 250SX class and how, in my humble opinion, that’s where the problems for these unemployed riders lay. Enough about that for now, let’s talk about one of these guys and what he’s going to do. That’s Dean Wilson. A past 250MX national title winner and the winningest 250SX rider of all-time who never won a title, Wilson’s had a couple of rough injury-plagued years at Red Bull KTM and finds himself homeless for now. Aboard the International Space Station, Expedition 50 Flight Engineer Peggy Whitson of NASA sent holiday greetings and festive imagery from the cupola on Dec. 18. The new wind tunnel tests are for the second generation of SLS. It will deliver a 105-metric-ton (115-ton) lift capacity and will be 364 feet tall in the crew configuration — taller than the Saturn V that launched astronauts on missions to the moon. The rocket’s core stage will be the same, but the newer rocket will feature a powerful exploration upper stage. On SLS’s second flight with Orion, the rocket will carry up to four astronauts on a mission around the moon, in the deep-space proving ground for the technologies and capabilities needed on NASA’s Journey to Mars. Scale models of the upgraded rocket in crew and cargo configurations are being carefully positioned in wind tunnels for test programs to obtain data needed to refine the design of the rocket and its guidance and control systems, said Dr. John Blevins, SLS lead engineer for aerodynamics and acoustics at Marshall. During hundreds of test runs at NASA’s Langley Research Center in Hampton, Virginia, and Ames Research Center in Silicon Valley, California, engineers are measuring the forces and loads that air induces on the launch vehicle during every phase of its mission. “All the critical aerodynamic environments, from when the upgraded rocket leaves the Vehicle Assembly Building at Cape Canaveral to launch, acceleration through the sound barrier and booster separation at greater than Mach 4 are evaluated in these four tests,” Blevins said. Ascent tests completed at Ames in November determined the rocket’s behavior as it climbs after launch, and the kind of instructions to be programmed into the rocket flight computer for guidance and control as the rocket passes through transonic flight. For instance, the tests will determine what commands the autopilot will send to the rocket’s nozzles to correct for wind or other factors and stay on course. Buffet testing at Langley in November focused primarily on how the cargo version of the upgraded rocket behaves as it moves through the atmosphere at just below the speed of sound, approaching about 800 miles per hour, then moves into supersonic flight. As the rocket approaches the speed of sound, shock waves build and move along different points of the launch vehicle. These shock waves can cause buffeting, shaking, vibration and unsteady loads that could result in damage or course changes that must be corrected, Blevins said. The cargo version of the upgraded rocket has a smooth fairing above the exploration upper stage instead of the Orion spacecraft and launch abort system, so separate wind tunnel testing is needed. Similar tests planned for the fall 2017 at Langley will include observing this transonic shock oscillation and buffeting on the crew version of the rocket, at both subsonic speeds and higher Mach numbers. At Mach 1.5 or 2, the waves terminate, or remain at the same points on the rocket for the rest of the flight, but they continue to change angle and strength. These wind tunnel tests are critical, Blevins said, because the location and temporal behavior of these shock waves are difficult to predict with computational fluid dynamics — they must be observed and measured. Two other test series are planned at Langley. The first in early 2017 will provide data to ensure that as the SLS’s two solid rocket boosters separate from the rocket during ascent, they don’t come back into contact with the vehicle. These tests are complex, Blevins said, because the models of the rocket’s core stage and each of the two boosters are separately instrumented, and even the dynamics of the small rocket motors that jettison the boosters are simulated. Next will be liftoff transition testing, scheduled in the summer. These tests will include evaluation of the effects of winds on the rocket as it is waiting on the pad, and the presence of the mobile launcher and tower during liftoff. Drift of the vehicle as it moves past the tower must be controlled to avoid damage and because the sound bouncing back from the pad can cause damaging vibration. NASA engineers have also teamed with CUBRC Inc. of Buffalo, New York, to use a special type of wind tunnel to better understand and analyze how the SLS heats up as it ascends into space. A model of the rocket was used in the first phase of aerodynamic heating tests in CUBRC’s Large Energy National Shock Tunnel (LENS-II) in September. A second phase of testing is planned for models of the SLS in crew and cargo versions, in early 2017. The SLS wind tunnel testing is very much a cross-agency effort resulting in information and new test techniques that also benefit other rocket and aerospace programs, said Dr. Patrick Shea. He’s based at Langley, but served as SLS aerodynamics test lead for the transonic ascent testing recently completed at the Ames facilities. For example, the Ames aerodynamics team is developing an optical measurement method involving Unsteady Pressure-Sensitive Paint. During a test, special lights and cameras will observe changes in the paint’s fluorescence, indicating the strength of aerodynamic forces acting along different areas of the rocket or test article. Ames was able to take advantage of the presence of the SLS rocket model to conduct its own tests using the paint. Spin a couple laps with Matt Bisceglia of the AutoTrader.com/ Monster Energy/JGR Suzuki team as he preps for the fast approaching 2017 Supercross season. This comparison of two views from NASA’s Cassini spacecraft, taken fairly close together in time, illustrates a peculiar mystery: Why would clouds on Saturn’s moon Titan be visible in some images, but not in others? In the top view, a near-infrared image from Cassini’s imaging cameras, the skies above Saturn’s moon Titan look relatively cloud free. But in the bottom view, at longer infrared wavelengths, Cassini sees a large field of bright clouds. Even though these views were taken at different wavelengths, researchers would expect at least a hint of the clouds to show up in the upper image. Thus they have been trying to understand what’s behind the difference. As northern summer approaches on Titan, atmospheric models have predicted that clouds will become more common at high northern latitudes, similar to what was observed at high southern latitudes during Titan’s late southern summer in 2004. Cassini’s Imaging Science Subsystem (ISS) and Visual and Infrared Mapping Spectrometer (VIMS) teams have been observing Titan to document changes in weather patterns as the seasons change, and there is particular interest in following the onset of clouds in the north polar region where Titan’s lakes and seas are concentrated. Cassini’s “T120” and “T121” flybys of Titan, on June 7 and July 25, 2016, respectively, provided views of high northern latitudes over extended time periods — more than 24 hours during both flybys. Intriguingly, the ISS and VIMS observations appear strikingly different from each other. 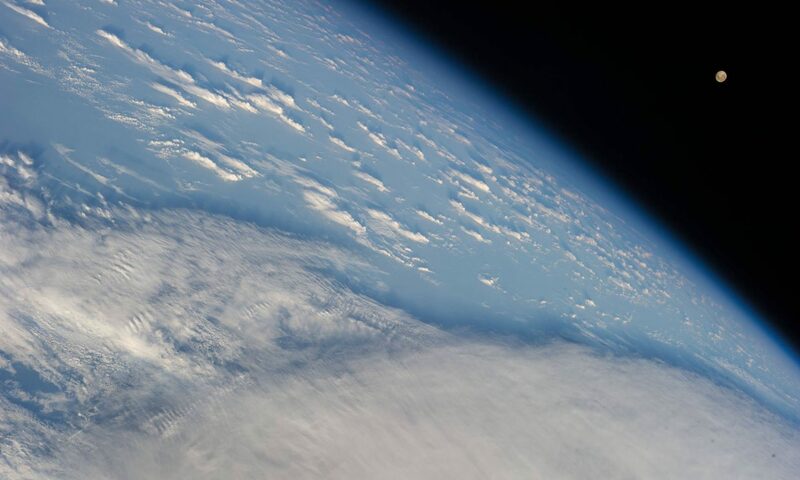 In the ISS observations (monochrome image at top), surface features are easily identifiable and only a few small, isolated clouds were detected. In contrast, the VIMS observations (color image at bottom) suggest widespread cloud cover during both flybys. The observations were made over the same time period, so differences in illumination geometry or changes in the clouds themselves are unlikely to be the cause for the apparent discrepancy: VIMS shows persistent atmospheric features over the entire observation period and ISS consistently detects surface features with just a few localized clouds. The answer to what could be causing the discrepancy appears to lie with Titan’s hazy atmosphere, which is much easier to see through at the longer infrared wavelengths that VIMS is sensitive to (up to 5 microns) than at the shorter, near-infrared wavelength used by ISS to image Titan’s surface and lower atmosphere (0.94 microns). High, thin cirrus clouds that are optically thicker than the atmospheric haze at longer wavelengths, but optically thinner than the haze at the shorter wavelength of the ISS observations, could be detected by VIMS and simultaneously lost in the haze to ISS — similar to trying to see a thin cloud layer on a hazy day on Earth. This phenomenon has not been seen again since July 2016, but Cassini has several more opportunities to observe Titan over the last months of the mission in 2017, and scientists will be watching to see if and how the weather changes. The Cassini mission is a cooperative project of NASA, ESA (the European Space Agency) and the Italian Space Agency. The Jet Propulsion Laboratory, a division of Caltech in Pasadena, California, manages the mission for NASA’s Science Mission Directorate, Washington. The Cassini orbiter and its two onboard cameras were designed, developed and assembled at JPL. The imaging operations center is based at the Space Science Institute in Boulder, Colorado. The visual and infrared mapping spectrometer team is based at the University of Arizona. The 2017 Husqvarna FC 450 takes fifth place at the Dirt Rider 450F MX Shootout comparison. The 2017 Husqvarna FC450 comes in fifth place in this year’s 450 MX Shootout. Our vet test rider Earl Watters gives you a quick break down on how the FC450 works on the track compared to the other models. Stefan Everts, Team Manager del Team Suzuki Factory è entusiasta di aver presentato una serie di programmi con i suoi giovani talenti e piloti che compongono il Team, coprendo una serie di eventi pre-season, Redsand internazionale, il 16 gennaio fino al 22, Hawkstone Park 5 febbraio 2017. Il più grande pilota dei GP di tutti i tempi, Stefan Everts ha una lunga relazione con Redsand mxpark. Sia il padre Harry che Stefan hanno tenuto i loro corsi li per decenni, così Redsand è anche sponsor del team ufficiale Suzuki. Ученые о космосе: итоги астрофизического года подводит Сергей Попов, известный популяризатор науки, профессор РАН, доктор физико-математических наук, ведущий научный сотрудник Государственного астрономического института имени П. К. Штернберга.